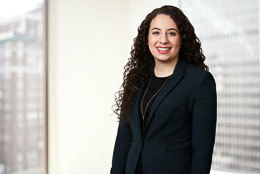 Cristina Fernandez is an antitrust associate in Axinn’s New York office. Her experience includes criminal antitrust cartel investigations, follow-on multidistrict class action litigation and arbitration, and civil litigation involving a variety of antitrust and unfair competition issues such as monopolization, exclusive dealing, and mixed issues of antitrust and intellectual property law. Cristina has also counseled clients on antitrust compliance issues, including advice regarding design of compliance programs. She has represented clients in industries including electronics, automotive, healthcare, financial services, insurance, and pharmaceuticals. Prior to joining Axinn, Cristina practiced in the antitrust litigation department of an international law firm. She earned her JD from Harvard Law School in 2012, where she was a member of the Harvard Journal on Legislation. She received her BA in Political Science, Phi Beta Kappa, from Emory University in 2009.